Well were do I start.... On Friday morning at 12:30 am I jumped out of bed waking up to a huge noise and my house shaking. I didn't now what it was and had no idea what scared me so bad to jump out of bed. All of my boys slept right threw it so I climbed back in bed completely out of it. The next morning I went out to run and this is what I saw. This is taken from our balcony. 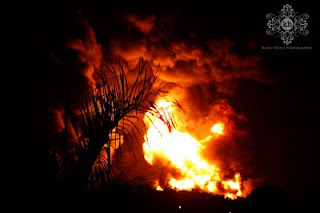 They still don't now how the fire started and caused the huge explosion. Eleven of the huge tanks burned up with flames getting even 600 ft tall! It was crazy! It burned until Sunday afternoon it caused had major damage to Ft Buchanan. This is the Army base were we get grocery's, and where Hudson along with other fellow Coastie kids go to school. The base is closed because of the damage and there was even damage at the schools. I am so grateful Hudson was not at school! I don't now how long it will be until he goes back to school and we are able to get grocery's there. It stinks because our food bill for the next month will double in cost. Oh well it could be worse. No one was killed just some minor injuries. They still aren't if it was just an accident or something else, we will just have to wait and see. This is a picture from across the bay down in old San Juan. The boys on top of the roof that next night looking at the fire. The sky was glowing because the flames were still so big. We couldn't get a very good picture at night. This is a picture that my friend Katie took ( I hope she dosen't mind) of the fire from her house. She lives just up the road from us. With school being out due to the school being damaged from the explosion we have been trying to do some fun activites for the kids. Travis has a few days off this week which worked out nice so he could join us. Today we went with our friends the Means to El Morro to fly kites. We have been wanting to do this forever, it was a lot of fun and the kids had a blast! Remy loved to hold on to it and would run over to help when ever the kite would go down. Remy being King of the mountian, he would stand their and just yell like he was so awesome. It was pretty funny other than him making me worry most of the time. He thinks he is just as big as his brother and wants to do everything Hudson does. Which is not always the safest thing! I actually joined in on the fun! Hudson told Travis "I want to jump to you like Nacho does ", I'd say he did a good job! Travis was nice and started a game of duck, duck, goose! The kids loved it and I think Travis liked it just as much. Hudson being silly with the stickers! Well were do I begin..... Hudson love's Nacho Libre, there is a lady that sells these masks down in old San Juan. We decided to buy the boys one and they love them even my biggest boy gets a kick out of them..... pretty scary! They had fire safety week at school last week and Hudson got to see the firefighters and got a sweet hat and coloring book! We was so excited to tell us all about it! My Brother Brady and his wife Alley came to visit us for a week at the end of September. We had so much fun, we love having visitors! We were busy the whole time they were here and saw a few new places we haven't been to yet. This is the light house in Cabo Rojo, their is a beautiful beach and on the other side you can hike up to the light house and see some cool cliffs. I was more than on edge while we were looking at the cliffs with the boys! I had a few scary thoughts playing in my head, do all Mom's imagine the worst! Poor Hudson's hand was probably killing him because I had such a tight grip on him. Boy's in the very top of the light house! When we were walking up to the light house the guard was standing at the gate and Hudson asked him if he could come in and look at the light house. The guard spoke very little english but couldn't say no to cute Hudson. He gave us a private tour and even let us go all the way up into the top of the light house! It was way hot up there and the stairs were a little more than scary, narrow and rusty! I love when they are good little buddy's Hudson helping Remy up the hill. This one is for Grandpa Lindz! BOYS! We also took Brady and Alley to our favorite beach! Culebra is a little island that we love! The beach there is amazing, white powder sand and crystal clear, blue green water! We ride the ferry over, this is us all worn out and on the way home! Don't mind the naked bum!! I Love it! The boys love to jump of the peir while we wait for the ferry to go home! This was Remy's first time doing it and he loved it! No fear! Just like his brother, which is not always the best thing! I love this picture, it totally looks like Remy is climbing back up the rope all by himself! Remy loving the hole Dad dug him, it kept him busy all day! Hudson played in the waves most of the time with a little Latin girl who spoke no english. It is amazing that kids find a way around it and it dosen't even bug them. Travis was standing by them and heard her say something to Hudson in spanish and he just said back " blah blah blah", it was pretty funny! He always finds a new friend at the beach. Thanks again for coming to see us, we had so much fun! Love you guys!